Archimandrite Juvenal Repass is a priest and monastic of the Diocese of Alaska, Orthodox Church in America. After teaching at St Herman's Seminary in Kodiak, Alaska for six years, he discerned a call to bring the message of holy Orthodoxy to lands and peoples that have not yet heard that saving message. Please help those who may benefit from his mission work, by your prayers, and, if God directs you, with your pledges. 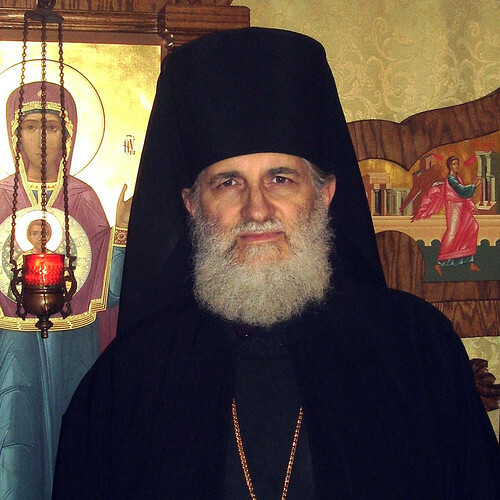 Born in 1953, Archimandrite Juvenal grew up in the town of Stratford, Connecticut, being raised as an Episcopalian. His birth name was John Repass. His family background includes English, French, German, Welsh, Irish, Scottish, Danish, and Swiss ancestry. His Repass ancestor came to the United States from Switzerland, having earlier migrated from France. Family lore also mentions some Cherokee Indian ancestry. At the age of 11, he and his family were invited by his piano teacher to attend the midnight Pascha service at St. Nicholas Russian Orthodox Church in Stratford. This was his first introduction to holy Orthodoxy. Later, when the priest, Fr. Stephen Antonuk, became Bishop Joasaph, his daughter and choir director came to live with Father Juvenal's family. At age 24, after a period of research, he decided to embrace the holy Orthodox Christian faith. He was looking for the "trunk of the tree,” so-to-speak, of Christianity, and concluded that Orthodoxy was it. Foremost in this decision was his desire to be certain that the bread and wine of communion were truly the body and blood of Christ, and that the priesthood was the authentic Christian priesthood. At the time, Father Juvenal was living in Evanston, Illinois. Having graduated from Yale with a major in biochemistry, he was working as a lab technician at Northwestern University in Evanston. In May of 1977 he began attending services at Holy Trinity Orthodox Cathedral in Chicago. Soon afterwards, he started employment as a medical technologist at the University of Illinois Hospital, a position he continued in throughout his seminary years whenever classes were not in session. Father Juvenal was chrismated on January 6, 1978, and in the fall of that year matriculated at St. Vladimir's Seminary in New York. He completed his studies there in 1981. He received his M.Div in 1988, after finishing the thesis requirement. Inspired by the lives of monastic saints like St. Seraphim, by his spiritual reading in the Philokalia and other books, and by his seminary studies in general, he also was drawn to the idea of the full liturgical life to be found in monastic life. Mindful also of the words of our Lord Jesus Christ, "Blessed are those servants whom the master, when he comes, will find watching," "If you want to be perfect, go, sell what you have and give to the poor, and you will have treasure in heaven; and come, follow Me,” "Of those to whom much is given, much is required," and the words in the Acts of the Apostles about owning all things in common, he was also guided by his spiritual father, Father John Meyendorff, and decided to try out the monastic life. He joined the community of St. John the Theologian, in Hiram, Ohio, in February, 1982, where Hieromonk (now Archimandrite) Alexander Cutler was the monastic superior. It was Fr. Alexander who had chrismated him. Father Juvenal remained at St Tikhon's for 22 years. During this time he worked in the St Tikhon's Seminary library, taught Greek in the seminary, helped with producing the magazine “Alive in Christ,” and worked on liturgical translations, which he had begun while at Hiram. In December 1991 he was ordained to the holy diaconate, and in May 1992 to the holy priesthood. In 2007 he was elevated to the rank of archimandrite. In May of 2008, he was offered the option of going to Alaska to do Church work. In August 2008 he moved there, and for six years he taught at St. Herman's Seminary in Kodiak while also ministering in local parishes, especially in village of Port Lions. Father Juvenal loves beautiful Alaska and its people, and especially the island of Kodiak, where he often was able to visit the nearby and beautiful Spruce Island where St. Herman Alaska had lived. His reason for leaving Alaska is very simple, consisting solely of the words of Jesus Christ: "Go therefore and make disciples of all the nations, baptizing them in the name of the Father and of the Son and of the Holy Spirit, teaching them to observe all things that I have commanded you ..." He is well aware that there remains a great need for clergy and other church workers in Alaska and in the rest of North America, but knows also that there are vast regions whose inhabitants have had no experience of Orthodox Christianity, and he desires to bring the words of truth and salvation to some of those areas. Father Juvenal visited Brazil for a month in 2013 and hopes, God willing, to labor in the Lord's vineyard there at a later date. He moved from Alaska to the lower 48 states in July 2014 in order to continue to make arrangements for mission work abroad. He visited Guatemala in 2015 and in January of 2017 continued to undertake full-time mission work in that country.